To root canal or not root canal? That is the question…. The aim of Root canal or Endodontic treatment, as it is known, is to save a badly decayed or infected tooth from needing to be extracted. This is done by cleaning out the inflamed & infected pulp, (the pulp is the soft tissue deep inside the tooth that contains nerves & blood vessels) using special instruments called files. Each root canal is cleaned out & enlarged. Medicaments are also placed inside the root canal to stop the pain & infection. You may need to come back a few times to complete the treatment. A filling or crown is then constructed to protect the treated tooth. • Extensive dental work to the tooth. • Breakdown of a filling or crown. • A crack in the tooth. Once the pulp of the tooth is infected, there are only two options; remove the infected tooth or a Root Canal treatment. This is one very good reason to get regular check – ups, make an appointment straight away if you break or chip a tooth, even if it doesn’t hurt & get any dental pain checked if it lingers for more than a couple of days. Problems if caught early can be more easily treated without affecting the pulp, preventing the need for a Root Canal…………. So should you have a Root Canal? Having a root canal will let you keep your tooth. This is the number one reason why we suggest you have one, if needed. Chewing, biting, appearance & the position of your teeth are all affected if you lose a tooth. Root canal treatment is successful in many cases & if you take good care of your tooth it may possibly last for the rest of your life. Root canals can be more expensive but there is a lot of work that goes into them & you get the benefit of keeping your tooth. 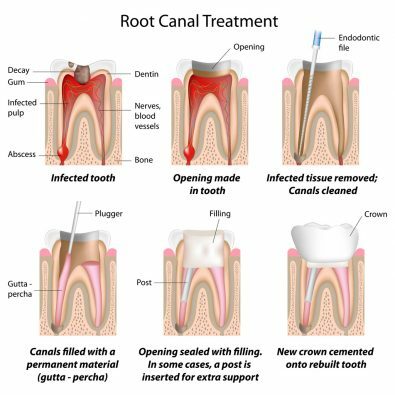 After a root canal you may need a crown to seal the root treated tooth to prevent reinfection & reduce the risk of fracture. A crown is usually made from porcelain; it will protect & strengthen the tooth as well as cosmetically improve it. Most dentists will only suggest a Root Canal if they feel it will be successful. If it is complicated they will refer you to an Endodontic specialist (they do root canals exclusively) to complete the treatment. Not all teeth are suitable for Root Canal treatment. Your dentist will discuss this with you at your appointment & other options that are available. Many people choose to not have a Root Canal & have their tooth extracted instead; this can be due to cost, fear or lack of time. If you decide to replace a missing tooth, the best option these days is an implant (artificial tooth roots inserted into the jaw to replace the missing tooth). These are a fantastic alternative to Root Canal in many cases. If you find yourself with a tooth that cannot be repaired by a simple filling, have a good discussion with your dentist which is the right course of treatment for you personally & if you decide to have a Root Canal make sure you have all the information you need so you are happy in your decision.